The developers at Twitter has came up with the lighter version of the Twitter app for Android. We are here with Twitter Lite Apk which is available for most devices with midrange to low-end specs sheet. The current official Twitter app for Android is getting laggy and heavy on the low end or budget smartphones. So the admins at twitter bring the Twitter Lite Apk app. We are here with the latest Twitter Lite 2019 Apk version 2.1.0-25 for Android devices. To download this app you must have an Android device with minimum Android 5.0 Lollipop installed on it. The best thing I personally liked about this Twitter Lite app is that it instantly shows the Video and images. Which official Twitter or main twitter apps lack. No matter how fast is your internet the main Twitter app always lags while loading any video uploaded or the High-quality Image. However in this Lighter version Twitter app we have the luxury of fast Image and Video loading. Get breaking news, politics, trending music, world events, sports scores, and the latest global news stories as they unfold. Easily market your business, find out the weather, interact with global brands and, quickly provide or receive customer service – all with fewer data. 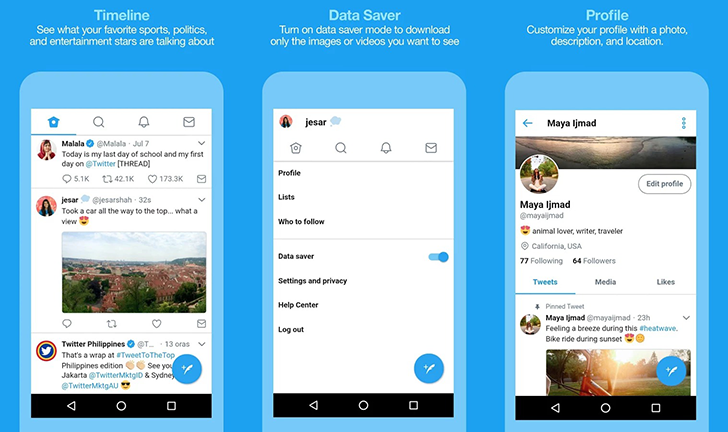 Same Twitter features new data saver capacity. Enjoy improved notifications for world news events, sports scores, weather updates, and the latest in local news. Get real-time updates for the news stories you care about. Save Bookmarks, Tweet in 280 characters, share trending videos, images, and much more.